This is a sponsored conversation written by me on behalf of Be The Best You Available at Publix. The opinions and text are all mine. For me, the beginning of a new year is a time to look at what I did last year, rethink my choices for the new year and set goals for my business, my family and of course, my wellness. Most of you know that over the last year I made some major changes to the way that I live. I dropped 40 pounds, rediscovered a love of exercise, and rethought my relationship with food. Where in the past food had been simply a comfort, it’s now become a way that I fuel my body to be able to do all the things that I want to do on a daily basis. With that in mind, I’ve spent the first few weeks of this new year really looking at what worked for me, what didn’t and what I want to change in this new year. 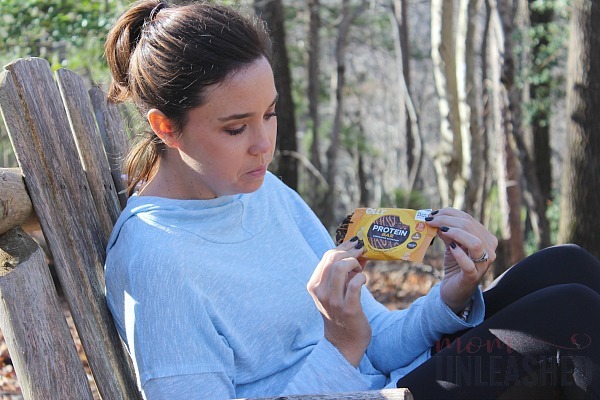 As I thought through the areas where I had succeeded and the areas where I had struggled, I realized that I was sabotaging myself by not having delicious items on hand for before and after my workouts. So, I decided to do something about it and created a delicious, protein packed Honey Mango Protein Smoothie that I actually look forward to (really, really look forward to) after my workouts each day. This creamy, delicious drink is a perfect way for me to add more protein to my diet while at the same time, reminding me of warm summer days spent on the beach. Read on to learn how to make it and how you can discover your “Best You” by shopping at Publix. 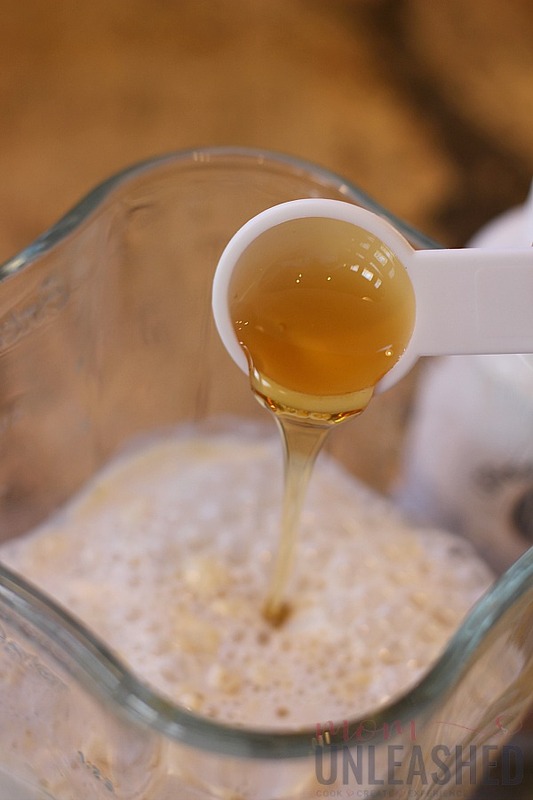 Before I get to my recipe for my Honey Mango Protein Smoothie, I guess I should share a little more about the process that led me to creating it. I think it’s fair to say that I’m adventurous when it comes to adding new foods to my diet and I love shopping at Publix to come up with ideas for ingredients that help me make better choices that I can feel good about. So, of course when Publix has their Be Your Best You promotion that’s happening from 1/26/29 – 2/23/19 and that boasts over $65 in savings on some of their popular wellness products going on, I head in store and browse the aisles (you can find out more about these awesome savings by clicking here). As I was recently walking through Publix scrolling through the list of eligible offers on my phone, I started to see a theme in my cart. 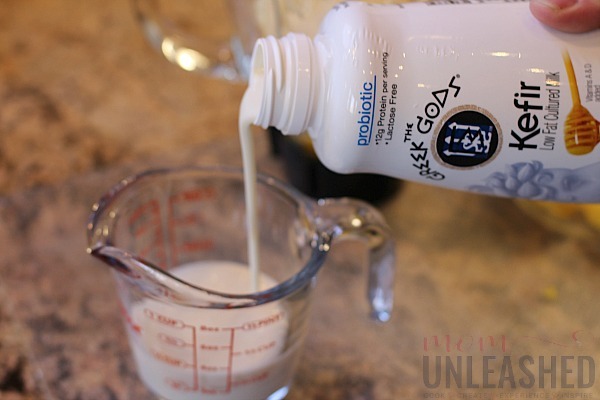 I had picked up OLLY Protein Powder and Greek Gods® Kefir in addition to many of the other items currently on sale. While I’m usually the “throw my protein powder in a little water and avoid drinking it on the way to the gym” type gal, I suddenly realized that if I combined these two ingredients with some fresh fruit and honey, I’d have a protein smoothie that I could actually get excited about. After surveying the available fruits and veggies in the produce department, I stumbled on honey mangos which literally have the taste of summer, in my mind. I added a few to my cart, picked up a few more items on the Be The Best You promotion and headed home to create my Honey Mango Protein Smoothie that I knew was going to be a perfect way to fuel my active lifestyle. 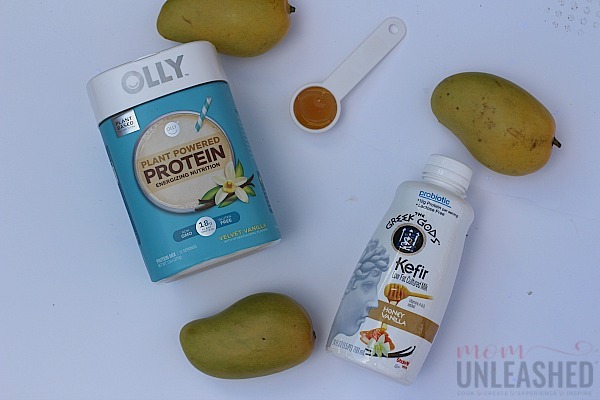 Once I had arrived home, I put away the extra items I had purchased and sat out my ingredients for my Honey Mango Protein Smoothie. Then I got to work creating what is arguably the best-tasting protein smoothie on the planet. 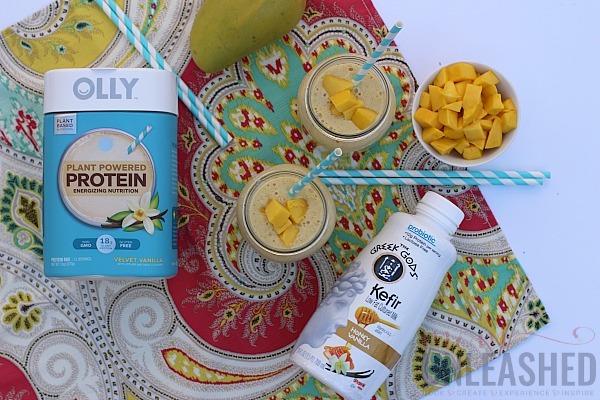 This honey mango protein smoothie boasts a sunny, bright flavor paired with a creamy texture that's perfect for any time of the day. 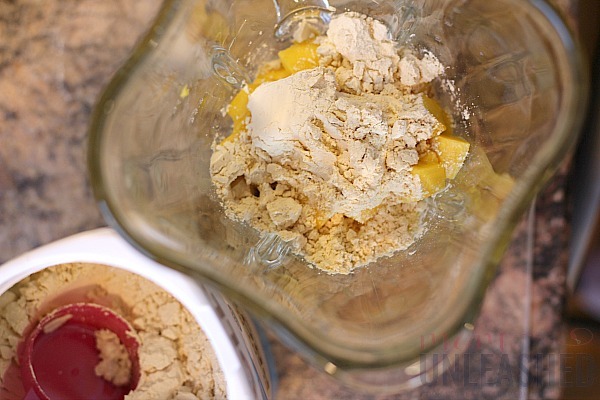 Add the peeled and chopped honey mango, OLLY protein powder, Greek Gods Kefir, almond milk, honey and ice to a mixer. Using the pulse setting, combine all ingredients until almost smooth. Switch to the blend setting and and continue to mix until you get a smooth consistency. 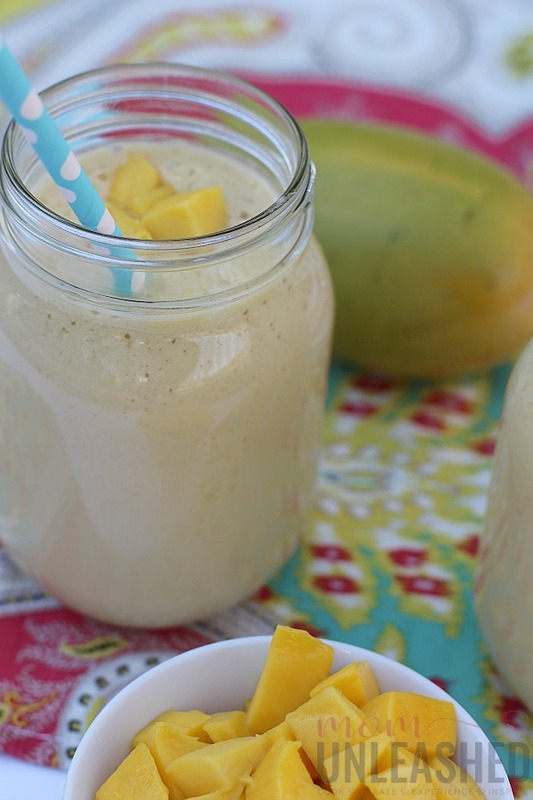 Pour the smoothie into a glass and garnish with a few pieces of honey mango. 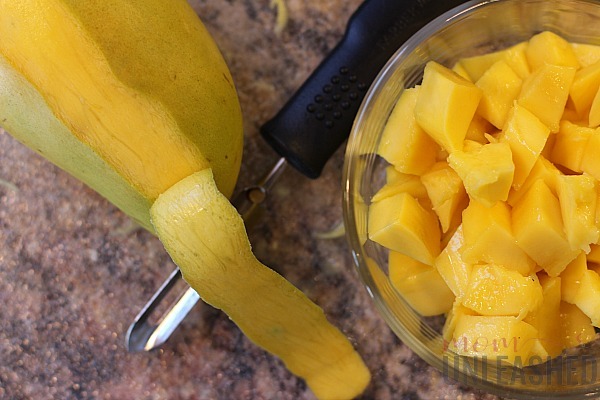 To make my easy Honey Mango Protein Smoothie, I first peeled my honey mango and chopped it into small pieces. After adding all the ingredients for my Honey Mango Protein Smoothie to my mixer, I started it on the pulse setting to break down the ice cubes and incorporate the honey mango into the rest of the ingredients. 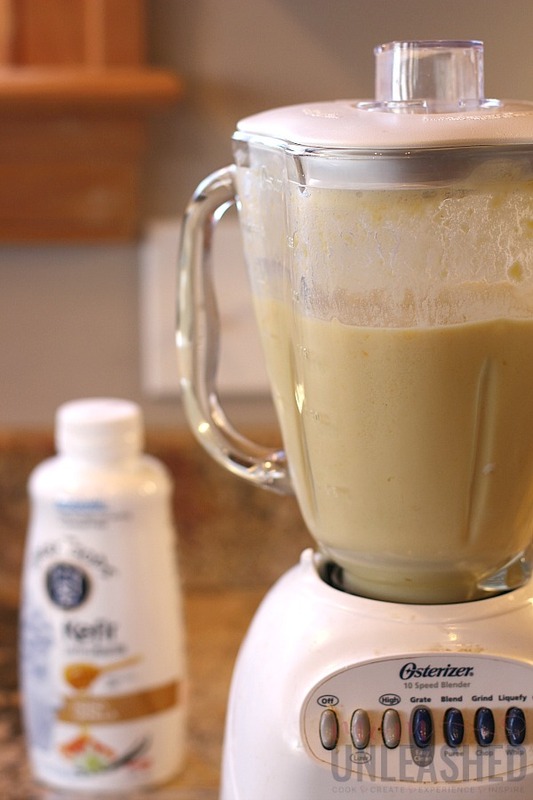 Once my Honey Mango Protein Smoothie was almost ready, I switched over to the blend setting and finished mixing my smoothie until it was creamy and perfectly combined. Once my Honey Mango Protein Smoothie was perfectly mixed, I poured it in a glass and garnished it with a few remaining pieces of my honey mango. 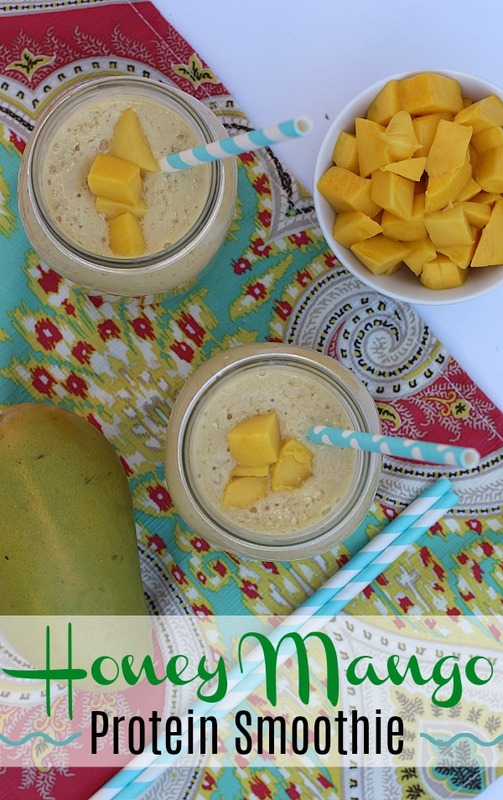 After adding a straw my Honey Mango Protein Smoothie was ready for me to enjoy! 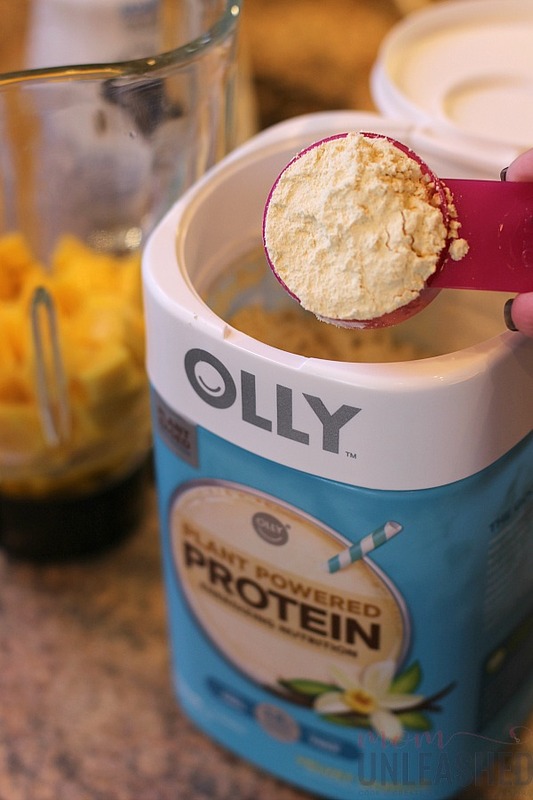 I love that I can have this delicious smoothie that’s packed with good protein from the OLLY Protein Powder either before or after my workouts, and not only does it fuel my active lifestyle, but it’s a delicious way to sit back and take a little break from my always busy life. But more than that, I love that Publix gives me a fabulous way to save on better-for-me items that fit in perfectly with my goal of being the best me this year. 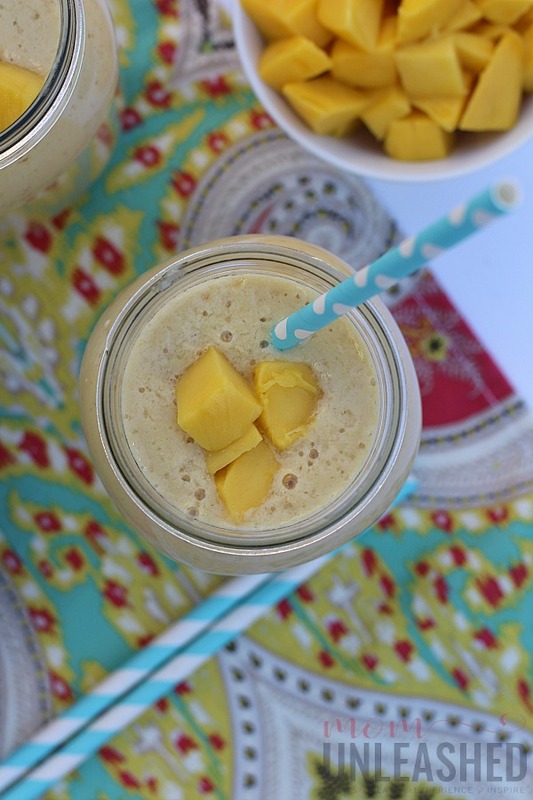 So truthfully, why did I share this Honey Mango Protein Smoothie recipe with you? Well, that’s simple! Not only did I want to share the recipes for this amazing smoothie that I use to fuel my workouts, but I wanted to share how any time I go to Publix, I’m inspired to purchase products that help me be the best me while working towards my wellness goals. While Publix is amazing all year long and always has unique products that really fit in well with my better-for-me lifestyle, right now is the time to head to Publix and stock up on amazing products to help be the best you at even better prices! Be sure to click here for a list of all products included in the Best You promotion that add up to savings of over $65! If you’re like me, you’ll want to take this list of ingredients, beverages, quick meals, medications and more and head in-store at Publix to see what products you’re inspired to add to your life in the new year. Whether your goal is to drink more water (Perrier® Carbonated Mineral Water in included in this promotion), snack smarter (why not pick up the OLLY Protein Bars?) or simply have better-for-you ingredients on hand that can be whipped up quickly and easily (try Tyson® Grilled & Ready® products), the Be the Best You promotion at Publix is the perfect place to be inspired to live your best life while saving on awesome products that you’re sure to love. So what are you waiting for? Today is the day to head to Publix because from 1/26/19 – 2/23/19, you can be your best you and get over $65 in savings with participating products at Publix. Whether you pick up the ingredients for my Honey Mango Protein Smoothie or come up with your own creation that will help you reach your wellness goals in this new year, you can’t go wrong when you shop this awesome sale! Now tell me, which of the items included in the Publix Be the Best You promotion are you most excited about purchasing? This looks quite tasty. 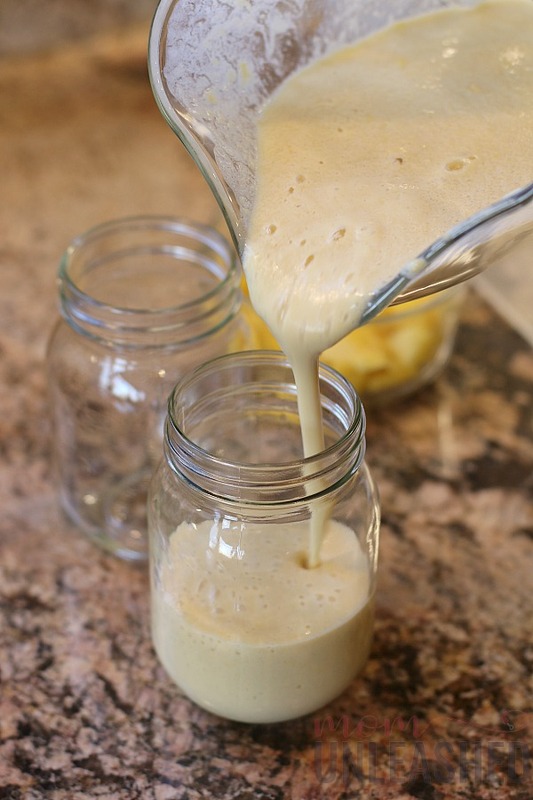 My kids really love smoothies, I’ll have to make this and see how they like it. We are huge fans of mango in our home! I bet my husband would love this. That just sounds refreshing! Yum. I will have to make this one day for lunch or maybe for an on-the-go breakfast! Yum! I like mangoes and having them with a protein powdered drink is a treat. It can boost metabolism and help stay full longer. I’m a huge fan of mangoes! They are so delicious! I have to say that I usually eat them plain, just peel them and eat. I haven’t added them to smoothies. Have to give your recipe a try. I love to wake up with a nutrient smoothie. It makes me feel better the entire day! 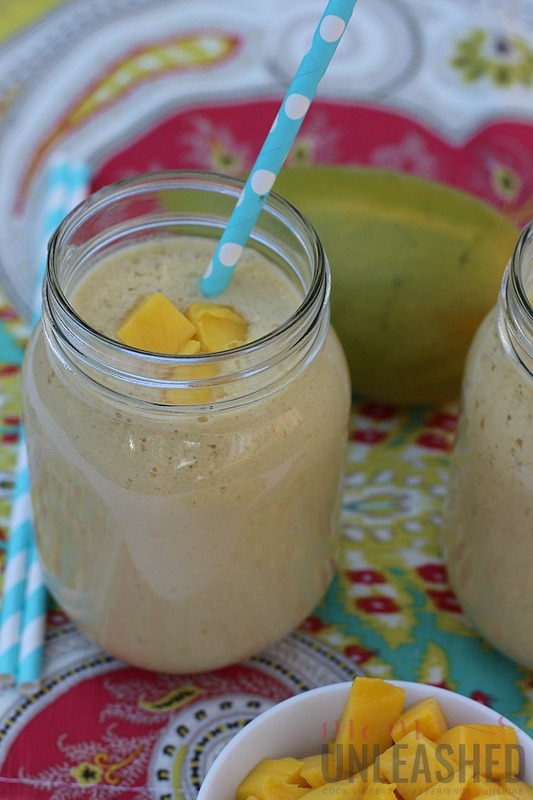 This mango protein smoothie sound like the exactly drink I need in the morning! This smoothie sounds so delicious. I love that it has extra protein. I would love to try this recipe.